I've put together photos + words that detail how I go about hand quilting. Quilting is such a vast topic with various approaches. This here is simply addressing the very stitch itself, as in how I start, stitch and finish each thread. To me there always seemed to be some mystery to the actual stitch and that classic motion of making it. Then I learned that you just have to begin. Right or wrong, start somewhere. I hope this post helps you do that. 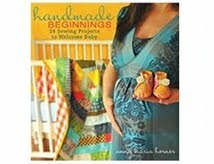 A lot of this info is in Handmade Beginnings (almost here!) but I didn't get the luxury of this much photo space in the book. So here you go, and thanks to Alexia for helping me take the pics! Have fun! Alexia and I both like to use big chunky thread for hand quilting. I use the little Perle Cottons that come wound in a ball, usually a size 5, 7, or 8 (the smaller the number the thicker the thread). DMC also has these gorgeous skeins of variegated cotton that Alexia is using in these photos. As for needles, I use embroidery needles cause they're nice and sharp but has an open enough eye for threading the chunky threads. Crewel needles work well too, they are typically just a little shorter than embroidery needles. Alexia also very cleverly cuts through the skein loop at one end to create several perfect length pieces for your quilting all in one snip. This way you don't have to unwind and cut the perfect length each time. Smart girl. 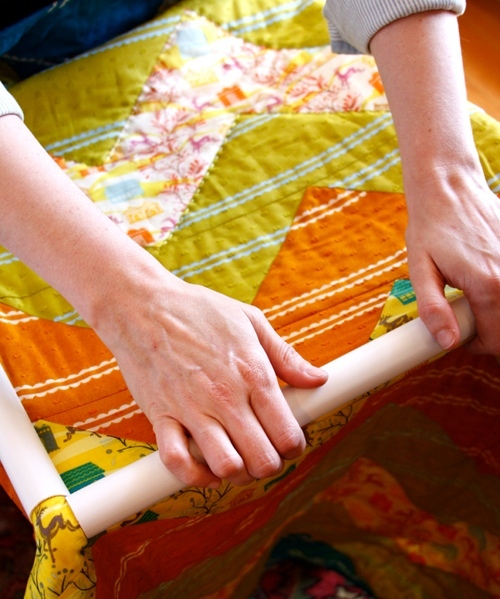 Many quilters like to use a quilting hoop or frame to keep all the layers nice and smooth as they stitch. I have a square laptop hoop that is made from plastic tubing that I find more useful than a round or oval frame that is harder to make use of once you get to the corners. I also like to sit up to a table when I quilt to have something to lay the frame against. 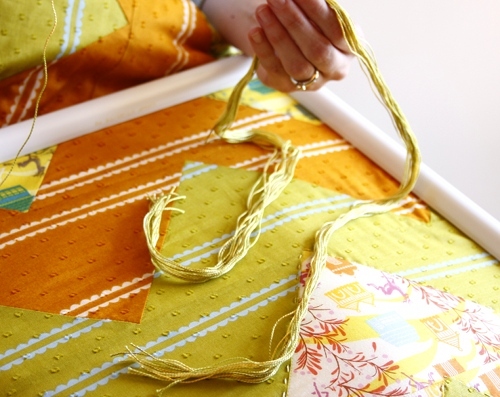 Stitching will be easier with a frame if you don’t tighten the fabrics so much that you can’t press gently on the quilt layer. This square frame with the snap-on sides adjusts tautness easily by just twisting the fitted outer pieces in towards the center or out towards the edges. I feel like I am putting less stress on the quilt fabric with this process than I do when tugging fabric through a wooden hoop. 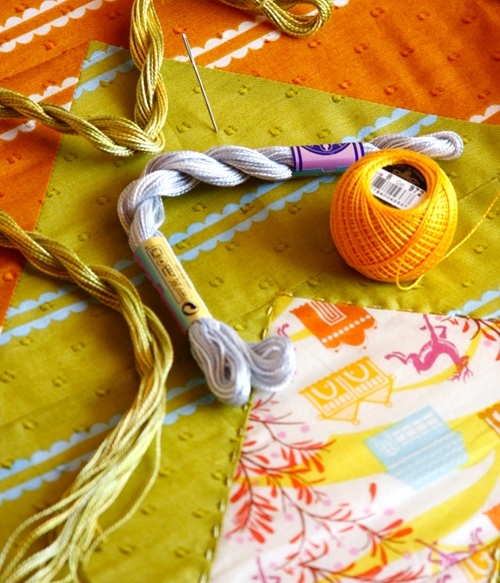 Whether you use a frame or not, you should always start at the center and work your way out with the quilt stitches. (And working stitches towards yourself tends to lessen the stress on your neck and shoulders.) To begin with, you shouldn’t be able to see any knots from the outside of the quilt, either the top or the back, so you’ll need to hide them. 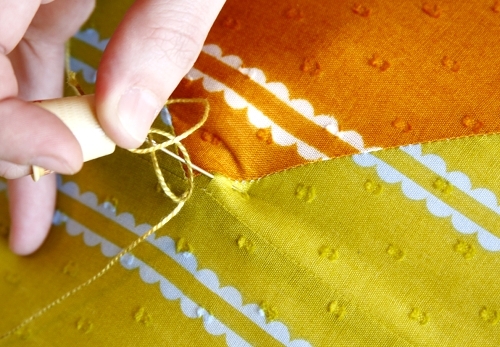 To do this, knot the thread within 1/4" to 1/2" of the end of the thread. Insert the needle into the quilt top just about 1/2" away from where you will begin your first stitch. Do not, however, push the needle through to the back, but instead come up where you want to begin stitching. Once popped through the quilt top, the knot will then be hidden in the inner layers and not visible from either side. 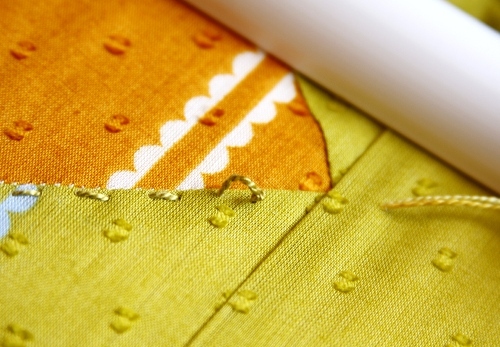 The goal of the simple running stitch is that it is generally straight and that each stitch is equal in length, equally spaced from other stitches, and equal in its distance from a seam if you are following along pieced seams. 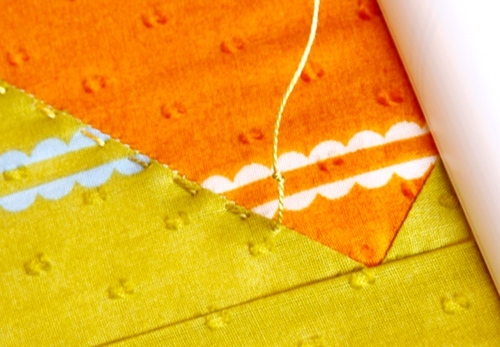 Enter the quilt top with the needle at a perfect vertical angle. Then as soon as you feel the needle from underneath, angle the needle back up as close to a vertical line as you can to push the tip of the needle through. 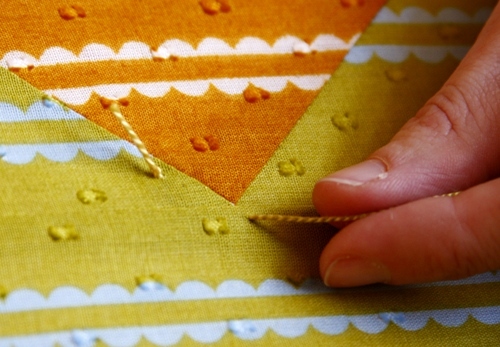 Focusing on this motion will help keep the stitches on the underside consistent with those on the quilt top. 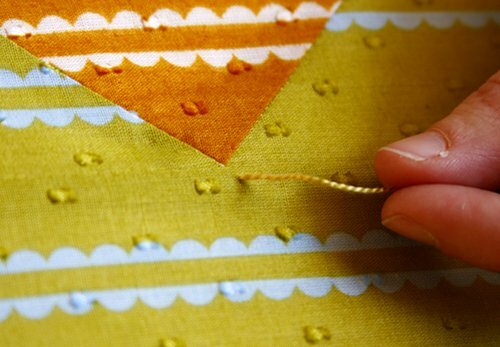 With practice, you will be able to load a few stitches onto the needle at once, in a sort of rocking motion. So you could try to head back down through the quilt with the tip of the needle again at a vertical angle. It's fine to go ahead and pull slack through after only one stitch. Take your time with your technique. As shown above however, you only need to pull through enough slack to give you room to load a few more stitches (or one stitch) onto the needle. 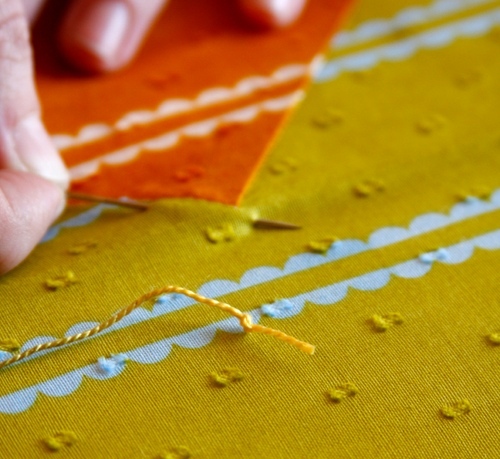 You don't have to pull through the entire length of thread with every stitch. This is particularly good to keep in mind if you are only going one stitch at a time. Conserve your time and energy by not pulling the whole length through every time, but maybe only every second or third time. And I definitely encourage going one stitch at a time! I can't stress that enough. 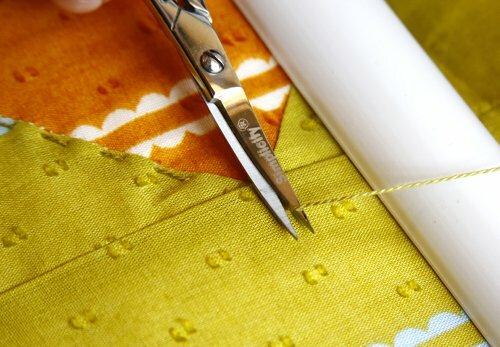 You should not feel like you need to master several stitches at once from the beginning. 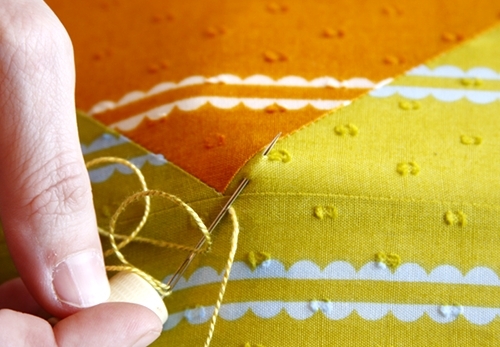 The better your stitches look the better you will feel about returning to the task. So while loading several stitches with one hand above the quilt and one hand below the quilt is very efficient, use whatever method gives you the prettiest stitch for now. 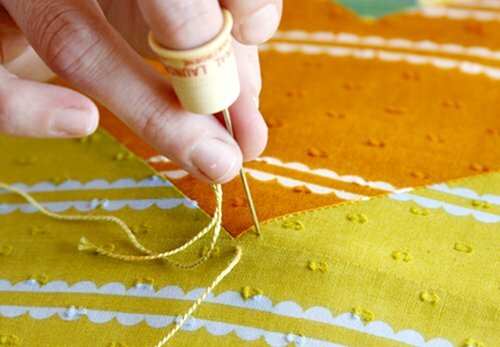 If you are performing one stitch at a time really well for a while, you will naturally begin to try a few more. 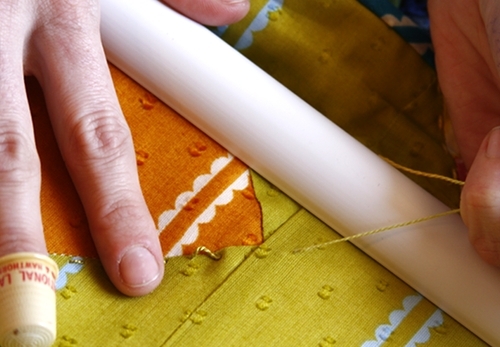 Stop stitching about an inch or two from the inside edges of the frame to prevent skewing the layers at all. Rather, continue to reposition the frame once you get that close. To make a finishing knot, the concept is similar to the beginning knot. When you are about to perform your last stitch into the quilt top, knot the ending slack of your thread about a stitch length (or 1/4") from the quilt top. Insert the needle to finish the stitch, but just through the top and then back out the top again an inch or so away. Pull the slack until the knot is lying against the top. Tug and pop the knot into the batting layer. Cut the thread close to the top, being careful not to clip the quilt top in the process. A curved pair of embroidery scissors is perfect for this. To start the next thread, this whole process would begin again on the underside, picking up where your last stitch left off. And instead of doing a full stitch ending up at the underside again, you would just poke through to the top, where you would continue your quilting from the quilt top side. Okay, so maybe I should be doing an egg dyeing tutorial today, but take what you can get! Speaking of, I need to go check my eggs. Busy week here of pre-Easter festivities coupled with some special little girl sewing which I'll share next week. I just started a quilt using embroidery floss as well. :) On the only other quilt I handquilted, I used quilting thread, but I must say I love the detail the embroidery thread gives. wow! thanks so much for this! i will certainly be turning to this when i hand quilt. I love quilts and my mom is an amazing quilter. One of these days I'm going to give it a try! What a great tute! Now, I wonder - what size/type needle do you use and any tips on picking out a good thimble? Aha! I have a lap-quilt-sampler I made from ages past, still sitting in pieces. Maybe now I'll be able to tackle the finishing part! Wow. The whole post is absolutely gorgeous. I can't imagine ever getting to a place where I can quilt--it's so exact!--but I must say this post tempts me! Such gorgeous photos! I just started stitching my quilt with the perle cotton and I'm a convert! I love the look of larger, thicker stitches. Much more fun! Thank you so much for sharing these pictures and tutorial. I have been contemplating using floss on a black and white wall hanging quilt that i am just about finished with. Would it be wrong to use black on the white with black fabric pieces and white on the black fabric pieces? All the quilting I have seen is in one solid color thread. I'm so happy you posted this--I have that quilt frame and it always seemed to hold the quilt too taut. I never thought of twisting the frame to create some slack--such a doofus I can be! This is such a wonderful tutorial. I have never hand quilted, but with these directions in my file now maybe I'll get the guts to do it one day. Thanks Anna! 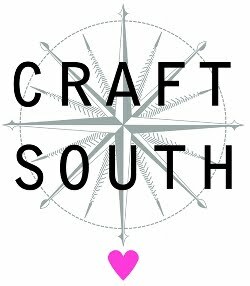 Oh, and you should check out my blog this week - I'm doing a giveaway of Bohemian fat quarters out of my stash I've been collecting and hoarding. So many newer quilters never even got a chance to see this collection (my favorite!) before and they all love it! Great tutorial! Gorgeous, gorgeous photos! And congratulations on the mention in Quilter's Home magazine's 55 favorite blogs! This is wonderful. Thank you. Happy Easter. thank you for this! I just learn so much here. I can't wait to get started! I have a request of a post... your basic schedule and routine of your day. I almost always write it in my post, and think about it even more, how does AnnaMaria get so much done! I have 6 "little folks" to care for as well. How do you make it work? I watched the video to promote your next book, and I have Seams to me, and I know that your studio is a place for you and your children. But do you have a regular schedule of worktime,cooking,cleaning,laundry, and family time? I am just curious how you blend it all, and not to mention blending it all so beautifully!! Wow! Thanks for this post....very inspiring. I love your colors (I always love your colors)! Thank you for this! It's beautiful and inspiring. Thanks for this great tutorial! I've done a little bit of hand-quilting, but this is inspiring me to return to my needle and try again! That's a really useful post - thanks! Do you have any shots of what the stitches look like from the back? It would be useful to have an idea of how they look for comparison to the front. I've been using the perle cotton #8 for my hand quilting also... but I didn't understand about the knot at first, and learned by some trial and error! this is really, really, helpful. where do you get a quilting frame like that? i recently got together with a group of women to hand-quilt a prayer-quilt for a friend who had lost her daughter. this friend was the only one among us who knew what she was doing, which was kind of comical and beautifully reciprocal at the same time. anyway, it was so meaningul to be part of such a group effort, and i hope your how-to post will inspire similar gatherings. I've been wanting to try hand quilting for a bit now. Until recently I always thought you had to use quilting thread. Then I found out you could use Pearl cotton and now I am eager to try hand quilting a baby quilt. I love the extra detail you get when you use a larger thread. p.s. We(I) decided not to dye eggs this year. The kids (10,18,21) always want to dye more eggs than we can eat lol. We are going to paint wooden eggs and decoupage Styrofoam eggs instead. well since my machine does nto wuilt this little tutorial has me curious now as to weather or not I would enjoy hand quilting. Thanks for sharing! Oh and I think I might even agree with the square- even if I havent tried it i like how it makes better sense on paper! Thank you so much for this post and all the tips. I have recently started working on my first quilt and I am a bit scared of the actual hand quilting. I will be returning to this post when the dreaded moment comes! you are so amazingly talented. you inspire me daily! You have just answered the question I have been asking since I got your little folks two weeks ago. 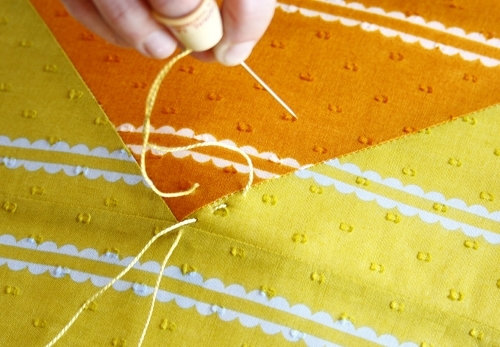 How do you hand stitch a quilt? THANK YOU!!! Thank YOU!!! This is such a beautiful and inspirational post !! I have been addicted to hand quilting for 4 years now. I find it funny that people are intimidated by it! It's sooo easy and soothing and therapeutic. I did a king sized quilt with the pearl cotton a couple of months ago (thanks to your mention of it in a previous blog). It's amazing how quickly the quilting goes! THANK you for sharing your talents ! This may sound a teensy bit nutso, but I love the way your hands look. They are beautifully real. I was wondering what the backside of the quilt looks like when you're finished with your hand quilting. Also, where does someone get one of these square frames? Thank you so much for this post! I've only ever done machine quilting up to this point precisely because I didn't know how to hide my knots while hand stitching. Now I'm excited to try this on my next project. Wonderful! that is so great!!! now i know how to hide my knots better!!! thank you so much!! wow...this post was a cool breeze for me. I have just started hand quilting and today is my day 2...i have blogged about my journery in my blog. i'm usignneedle number 10 what do you suggest. my teacher told me to use needle number 12 . but i couldn't find it here...i think your needle is big ...don't know it is big only in the picture. thank you for sharing your ideas. Even though I'm an avid hand quilter, it was nice to read your how to just to know I do most things this way. As a self taught quilter I'm never sure if my way is the most efficient! Thanks for sharing this! It's very much how I learned to do it years ago when I was in jr high from a lady at church. Now I know I'm still doing it right when I eventually do get around to doing it! Thanks for the beautiful and well done tute! You didn't mention basting....do you just start in the middle and not bother basting? I'd also like to know what size needle you choose with what size perle cottons. Thanks again!! Thanks for the tutorial! Just finished my first twin-size hand quilting project ... took only a year to finish using small thread. Can't wait to try the thicker thread tho. I love the look! oh it looks so nice, now I'm going to have to try it. I love your fabrics. I got some not to long ago but I haven't decided what to make with them yet, maybe a quilt with be the answer. Fill free to stop by and say hello. I totally agree with you about just beginning. For whatever reason, before I started hand quilting, I was so intimidated by it. One day I finally built up the gumption to give it a go. I haven't turned back since! Hiding the knot is always the hardest part for me. I'm just getting back to hand quilting due to knee injuries so the timing is nice. And I don't know why I didn't think to start in the middle for hand quilting as I do when machine quilting. Duh! Oh, and I adore the frame I have that is exactly like yours. Easy to use. Good Morning! I am so pleased so happy to have found your blog and I'm in love with it. I love the whimsical colorful fabrics just beautiful. I love love love. I will be back and I have my eye on a few fabrics I simply adore. Have a beautiful Easter sunny day!! One question though, how do I follow the line on the back of the quilt? I can use the pieces on the front to keep my stitches straight, but what about when I turn it over?? This post makes me want to take up quilting. Thanks so much for sharing in such a clear and lovely way. I do love how everything you do looks--so "artful"! I am noticing in these comments that newcomers to hand quilting are very excited about using the larger stitches and perle cotton. As a long-time, traditional handquilter I feel compelled to remind/inform that these larger stitches will be more prone to catching on objects such as toenails, small buttons, etc. Perhaps the stronger perle cotton will not break, however. Janet- thanks so much for your input! These stitches are large, as in about 1/4", which isn't that large unless you compare it to the tiny, finer and more traditional quilt stitches, of course :) I really liken this type of stitching that I do to embroidery details on a quilt with the bonus of it holding the quilt sandwich together! This is a great post. I've always been a teeny-tiny-stitches-with-quilting-thread-type but yours are really beautiful. Maybe I'll do my next one your way. I'm making a special quilt for our 10th wedding anniversary using the Good Folks set and because of the size, I got a bit scared of quilting it as I'm a novice at this. After seeing your post, I've started hand quilting our quilt now. So thank you for the post. My only problem is I cannot seem to be able to tug the beginning knots through so I wonder if I will ruin the fabric if I tug hard? Thanks for the experiment. It was very interesting. I keep in mind and i will try it. Just one word "Awesome". I give the credit to the person who made it. When we noticed the just do it, you may maybe remember the Nike shoes spirit. It has inseparable interconnection using america old wisdom. We have to possess that method of life, especially when we are hesitate, we are able to use this sentence stimulate ourselves. The meaning enclosed on this sentence could possibly be the generate and determination, it is worried with everyone. No issue no issue whether we are able to be the athletes or not, what’s the coloring of your epidermis tone and hair, if you suffered the actual physical or interpersonal limitations in life, we have to convince we are able to do it. I will seriously like to say that stitching is indeed very hard job. Not a type of job I would like to do. It is my pleasure to thank the author of this blog. I am grateful to the author for providing this useful information in this blog. Alexia also very cleverly cuts through the skein loop at one end to create several perfect length pieces for your quilting all in one snip. Such an wonderful stitch!! !loved that...It is an easier way to learn the the process...How artistic each of the stitch is!!! eek - the volume of spam posts says that maybe you haven't been to the comments on this post in a while! nonetheless - after reading this post over a year ago, remembering it, i finally came back to it today on my first attempt at serious hand-quilting. of a queen size quilt, no less! so thank you for all of your inspiration and instruction! What a nice hand works! I wish I could have a wife who would make some things for me by her hand! Thank you for sharing the post. The creativity is really brings an extra ordinary looks on the whole theme.Its really an appreciable work. Thanks so much for this! i will certainly be turning to this when i hand quilt. The whole post is absolutely gorgeous. HCG Blue Drops allow your body to burn the fat for energy instead of the food you would typically consume. I wish I could have a wife who would make some things for me by her hand! Thank you for sharing the post. Nice work keep it up . I never saw somebody making one, but now after reading this post i will ask my wife to learn about this thing. This drops are really getting passionate day by day. Incredibly increasing. There has been alot of changes being made to the system lately. Thanks for letting me know such great blogs. Great shared... Really Very interesting blog post. We are going to paint wooden eggs and decoupage Styrofoam eggs instead. This here is simply addressing the very stitch itself, as in how I start, stitch and finish each thread. Pretty smart post. I simply stumbled upon your web log and wished to mention that I actually have extremely enjoyed reading your web log posts. Any approach I’ll be subscribing to your feed and that i hope you post once more before long. The concept NJOY’s best electronic cigarette, which undisputedly contain nicotine distilled from tobacco plants, aren't “tobacco items,” and therefore excused from regulation underneath the FDCA, is both irrational and unlike the unambiguous intent of Congress. The FDA’s novel and-reaching theory of FDCA jurisdiction ought to be declined." It looks beautiful but I'm afraid you miss out all the information that tells us how you did it, so misses the point really. We can all go our own way without a 'tutorial' , it would have been nice and helpful to have been told your own specifics, otherwise I'm not sure what the point is apart from pretty pictures. A good teacher explains. I just seriously like your web site lol… I just now read something simular to this on That Are i believe they may of stolen the blog? i found this post following bijou lovely's participation in your quilt con class - the level of detail here is amazing! just wanted to thank you for breaking down the process to make it easy. i embroider and i quilt: why not marry the two?! People who snore may be funny but when you want to sleep with someone who inhales noisily throughout sleep noisally each evening, it might be annoying. This is why, you need to know of approaches for preventing snoring. Breathing exercise - Snoring occurs when prone to obstruction happening within the breathing passage, mainly in the throat area. Which blockage may be due to a hardened throat, wrong situated jaw, or stuffed nose. Take several breathing to be capable of relax the throat making breathing normal again. Decongestants - You will find instances where the explanation for snoring is nasal congestion. Here, the individual features a inclination to breathe through his mouth that may trigger snoring. Taking decongestants will free any blockage and reduce the individual from snoring. Anti-allergy medicines - You will find some allergic reactions that create the enlargement of adenoids. When the allergy is healed, the anti snoring products usually stops. I recently wanted to declare hello there and display my thanks for the information given. I am looking forward for your next post.This really is an awesome post.valuable and excellent design. Likewise, don't neglect that trustworthiness http://www.bestessays.com/custom_research_paper.php is the vanquish course in seeking monetary serve. Love this post. Where can I buy the frame you use for lap quilting? What is the price? Is this what you would recommend for a beginner? Nice stuff you got,very well in writing and intriguing to read. Well, I really realize your work,if you have time don't forget to visit. Bravoo, bravo! Beautiful to look at, interesting to read and learn. 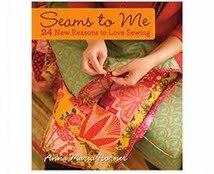 I have bookmarked and WILL add to the Quilting Resources section of my blog for personal reference and perhaps someone else may benefit. Neophyte quilter here (two weeks) so I've been reading all that I can about the subject. Hey, quilters are on to something with this Perle cotton thing. I love cotton and enjoy looking at vibrant colors. That a two-fer when it comes to the quilting stitch with Perle cotton. 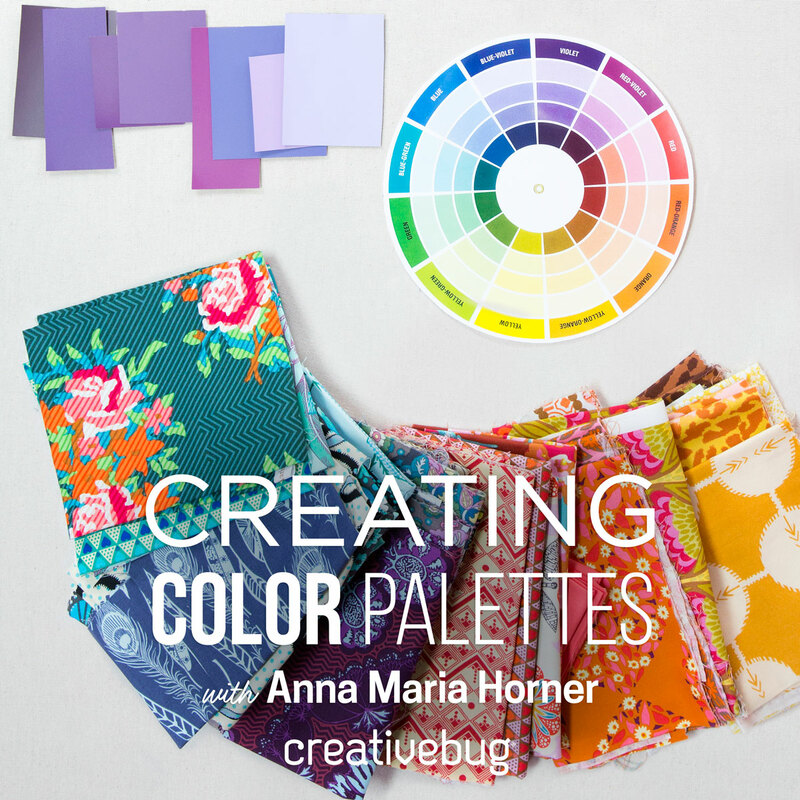 Keep up the good work: blogging and your textile arts. P.S. If you can, please consider "liking" my FB page at http://www.facebook.com/sewandcro. Haga clic en el enlace para aventurarse a Dr. Charles sitio Web reducción de peso Aspecto oficial para comprar y descargar de grasa corporal pérdida aspecto PDF e-book y también el sistema de reducción de la grasa total. ohh my god! is beautifull!! !